The Department of Education is supposed to keep track of such incidents, but it lets schools slide on reporting. Critics fear the situation will get worse under Betsy DeVos. 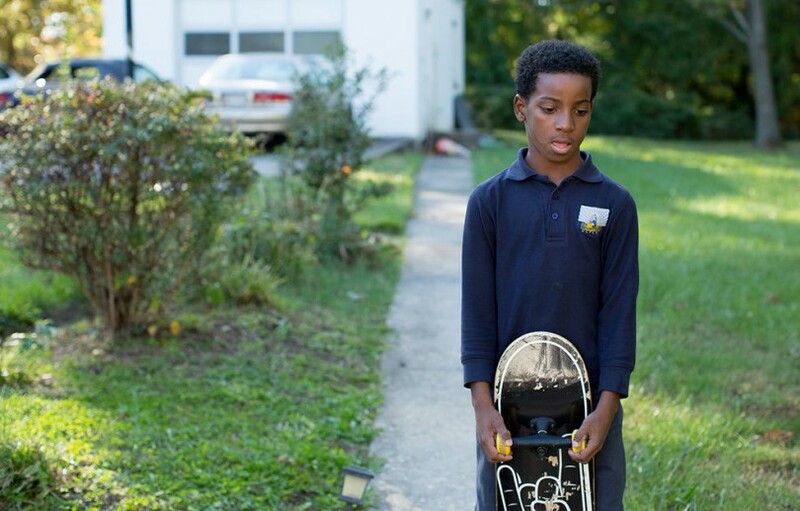 King Norris, who turned 9 on November 4, told staff at his previous school, Achievement Prep, that he wanted to kill himself following punishments in which he was regularly locked into a repurposed closet when he was a first grader there. Kaden Perrizo was 11 years old when he entered an “orthopedic impaired” class at Taylor Elementary in Santa Clara, California. Kaden suffered an immune system disease as a toddler that left him unable to walk without leg braces or to speak more than a few words; his parents say he functions cognitively like a 4-year-old. His teacher, according to allegations set forth in a lawsuit brought by Kaden's parents on his behalf, tied him to a chair. He was also confined in a 3-by-4-foot cell made of bookshelves. The lawsuit also alleges that the school turned a blind eye to the teacher's conduct until a staff member sent an anonymous four-page email to supervisors. But as far as the federal government is concerned, none of what Kaden endured ever happened. That’s because the incidents were not reported to the Department of Education as required by law. During the 2013-14 school year, both Taylor Elementary and Santa Clara County Special Education, which runs classes like the one Kaden was in, reported no restraints and no seclusions. The county office, while admitting no wrongdoing, settled the case last year for $2 million and ordered the teacher and the principal to undergo child abuse and reporting training. In response to a request for comment, the Santa Clara County Office of Education’s chief public affairs officer, Peter Daniels, noted that the settlement did not admit guilt and that the teacher denies the allegations. More than 70 percent of restraints used on special education students are likely not reported to the DOE. Charter schools report substantially lower numbers of restraint and seclusion use, which experts attribute to underreporting. In Washington DC, a charter-rich city, the city's charter schools operate without guidelines when it comes to restraint and seclusion. Every two years, the U.S. Education Department’s Office of Civil Rights sends a survey to all public and charter schools in the country asking for data about academic and disciplinary issues. It’s the only national reporting requirement for restraint and seclusion, techniques that are disproportionately used on special education students. “Special education teachers can encounter a wide range of behaviors that stem from their students’ disabilities and can be difficult to handle, but they may respond too often with physical restraints and seclusion instead of less invasive techniques.” Lawmakers and advocates rely on this data to understand the scope of the problem and to target problematic schools. But an analysis by POLITICO of the survey data, and interviews with dozens of advocates across the country, show that the numbers are dramatically underreported and schools are not held accountable. One such school is PACE East, a special education school near Manassas in northern Virginia. According to entries on a “behavior intervention log” kept by the school and reviewed by POLITICO, in 2011, a student was held face down on the floor for throwing his breakfast in the trash—a type of restraint prohibited in many states because it has caused multiple children to choke to death. In another incident, according to the log that was cited in a discrimination complaint filed with the federal Office for Civil Rights, a student was held in a locked room for about five hours until he urinated on himself. During the 2011-12 year, staff at PACE East secluded or physically restrained students a total of 144 times, according to a letter of findings to the plaintiffs’ lawyers from the Office for Civil Rights about its investigation. But when it came time to report the number of times children had been restrained or secluded, as required by federal law, the school submitted a very different number: zero. Two years later, PACE East again reported no restraints and seclusions. So did all other 88 otherschools in the Prince William County district. Kavits said the schools reported zeros at the direction of the Education Department because they didn’t have the ability to transmit the data in an electronic format. (The Office for Civil Rights disputes that those were the instructions it gave.) Prince William County explained in an accompanying comment to the department that the zero indicated the data were unavailable. But there’s no way a member of the public would know that zero didn’t actually mean zero, because there’s no such explanation in the report. The district’s across-the-board zeros aren’t anomalies. Nationally, about 12 percent of public schools reported any use of restraints on special education students to the Education Department in the most recent survey, and about 4 percent reported seclusions. New York and Chicago—major cities with huge student populations—reported none. The data appear even spottier in charter schools. Four percent of the 6,000-plus charter schools nationwide reported any restraints for special education students to the most recent federal survey, and 1 percent reported seclusions. According to a top official involved in reviewing the data, the Education Department has been aware the data are incomplete from the very first time the department surveyed schools about restraint and seclusion, which the Department of Education defines as a restriction that “immobilizes or reduces the ability of a student to move his or her torso, arms, legs or head freely” and “the confinement of a student alone in a room or area from which the student is physically prevented from leaving.” In an email, Education Department press secretary Liz Hill acknowledged that the department “is aware that erroneous data may be reported, and some inconsistencies may be included in the dataset.” But little has changed. Advocates fear that an already broken system will only get worse under the new administration of Education Secretary Betsy DeVos, a longtime champion of charter schools, which depend on public tax dollars but often don’t answer to local school boards. 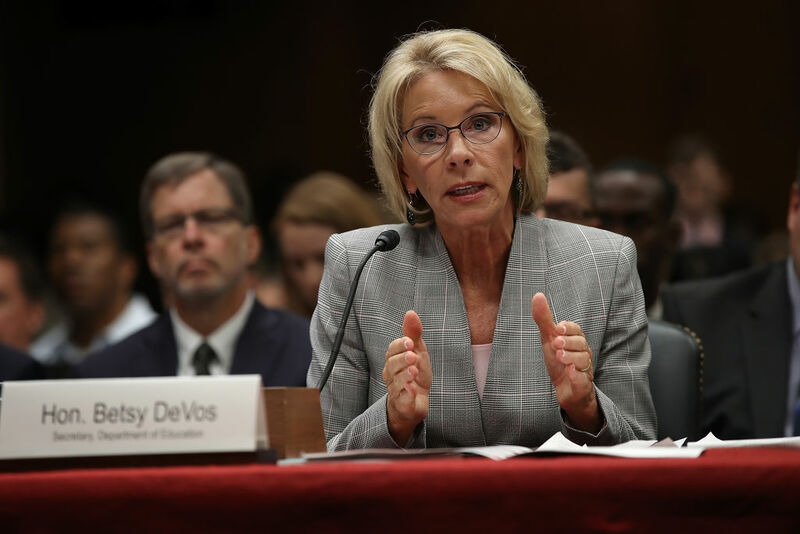 Although she hasn’t spoken specifically on the use of restraint and seclusion (and the Education Department declined to make her available for comment), DeVos has signaled that her department might roll back protections for special education students. Most restraint and seclusion protections stem from the Individuals with Disabilities Education Act (IDEA)—the federal law, dating to 1975, that requires publicly funded schools to serve students with special needs. During her confirmation hearings, DeVos suggested that IDEA requirements should be “left to the states,” which often don’t have the resources of a federal agency; when pressed during the hearing, she added that she might have been confused about whether IDEA was a federal act. In June, the Office for Civil Rights, which both administers the data collections and handles allegations of excessive restraint and seclusion, decided to narrow its approach to investigating complaints. Candice Jackson, the acting head of the OCR, announced in a memo obtained by ProPublica that investigators should no longer look for schoolwide problems—unless there is reason for “systemic concerns”—but focus on individual incidents instead, an enforcement strategy that one critic likened to “whack-a-mole.” And in July, DeVos announced that the Office for Civil Rights would scale back its use of so-called “Dear Colleague” letters, a form of nonbinding guidance that the Obama-era civil rights office used to expand protections for special education students, especially those in charter schools. Before becoming secretary of education, DeVos led or was on the board of several organizations that advocated for voucher programs to help public school students move into private schools. Voucher programs, including those pushed by an organization DeVos chaired called the American Federation for Children, often require parents to waive their children’s IDEA rights as a condition of eligibility, potentially leaving disabled children without many accommodations, in segregated classrooms, or subject to expulsion without due process or recourse. “Basically, you can either go to a public school or you can sign away your rights,” says longtime education attorney Diane Smith Howard. Education Secretary Betsy DeVos testifies before the Senate Appropriations Committee on Capitol Hill June 6, 2017 in Washington, DC. Smith Howard has worked extensively with the federal data collection. She and other advocates worry that DeVos’ Education Department will stop gathering some of the data or simply end the survey altogether. The final decision is still pending, although press secretary Hill noted in an email that the funding for the collection has not changed since DeVos took the reins of the department. Until January 2009, the federal government didn’t pay much attention to the use of restraint and seclusion in schools. That year, the National Disability Rights Network released a bombshell report arguing that inadequate regulations had led to the deaths of several children who were held face down on the floor. Prone restraints had been banned in psychiatric hospitals that get federal funds after a 1998 Hartford Courant series exposed their danger, but the technique was still allowed in schools in almost every state. A few months later, the Government Accountability Office released its own report, “Selected Cases of Death and Abuse at Public and Private Schools and Treatment Centers,” revealing “hundreds of cases of alleged abuse and death.” When the reports came out, 19 states did not regulate restraints at all, and only five banned dangerous prone restraints, according to the NDRN report. Although it’s clear that the federal numbers are flawed, it’s difficult to pinpoint how extensive the underreporting is. But it’s possible to get a good clue by looking at data from the few states that have implemented their own surveys. The difference between the state and federal surveys indicates a significant reality gap. Since 2012, Connecticut state law has required every school that provides special education to record incidents of restraint and seclusion, and has made the state Department of Education produce annual reports based on those records. For the 2013-14 school year, the most recent year for which federal data are also available, Connecticut found that about 28 students were restrained out of every 1,000 served under IDEA, the federal special education law. In the federal data collection for that year, the nationwide data showed about 8 students getting restrained out of every 1,000 IDEA students. For charter schools alone, the nationwide reported rate dropped to fewer than 4 students per 1,000. If Connecticut’s numbers are representative of the national rate, it appears that more than 70 percent of restraints used on special education students in public schools are not reported to the federal government, and more than 85 percent in charters. In Louisiana, where New Orleans holds the country’s most charter-dense school district, a law passed in 2016 required the state Department of Education to publicly release detailed annual breakdowns of each school system’s use of restraint and seclusion. “The reporting from what I’ve seen is light years better than what I’d seen the previous year,” says state Senator Jack Donahue, a Republican from the New Orleans area who introduced the legislation. A POLITICO analysis of the 2015-16 data, released under Donahue’s law, found that seven of the 10 school systems statewide that used the most restraints and seclusions per special education student were charter school companies in New Orleans. At one charter school, Success Preparatory Academy, a single student was restrained or secluded 160 times. In the previous federal survey, from 2013-14, that same school had reported zero uses of restraints and seclusions on special education students. When schools are left to monitor themselves, the results can be grave. In Kentucky in 2014, a 16-year-old autistic student had both his legs broken by a school staff member who was holding him down—the school district ultimately paid the student’s family $1.75 million even before a lawsuit was filed. In Louisiana, a 5-year-old girl died in May 2010 while strapped into a chair for people with disabilities. A lawsuit by her parents won a $4.5 million judgment against the school district, but the school system’s administration called her death an “isolated incident” and did not change the district’s policies. The incident wasn’t reported to the federal data collection that year. The school district perhaps most in need of oversight is the one in the backyard of DeVos’ new office. Washington, D.C., is one of the nation’s most charter-dense school districts, but the city’s charter schools, which educate close to half the students in the district, operate without guidelines when it comes to restraint and seclusion. Traditional public schools in the district have robust guidelines that give detailed definitions of seclusion and different kinds of restraints, lay out conditions for when they can be used, and explain the procedures for documenting and reporting restraints and seclusion. Charters in the district, on the other hand, are overseen by two agencies, the D.C. Public Charter School Board (PCSB) and a 10-year-old agency called the Office of the State Superintendent of Education (OSSE), neither of which claims responsibility for regulating restraint and seclusion in charter schools. The District’s PCSB has a two-page document that explicitly notes the board “does not dictate the specific course of action in school discipline plans.” It contains a list of “tips and reminders” for charters creating their own discipline plans, and it doesn’t mention restraint or seclusion. According to a lawsuit filed on behalf of her parents in the U.S. District Court in D.C. in April, Abagail was 3 years old and could barely see or speak because of disabilities stemming from brain damage at birth when three teachers aides and one teacher in her pre-K classroom at Bridges Public Charter School in Washington put her on a cot, piled bean bag chairs on top of her, and put their feet on the bean bags to hold her down during nap time. The lawsuit also alleges that Abagail, whose last name is being withheld at the request of her parents, screamed throughout the 2015 ordeal, which happened several times that year. She allegedly became anxious and fearful, and the complaint suggests her intellectual capacities regressed. In other instances alleged in the lawsuit, an autistic child was grabbed by the throat and pushed into a bookcase, another was carried upside down by his feet, and a child with Down syndrome was dragged on the floor by one arm to the bathroom. These incidents only came to light because a new teacher at the school contacted the police, according to the complaint. The school’s lawyers have denied the allegations. In an email to POLITICO, Olivia Smith, Bridges’ founder and head of school, said that Bridges “immediately and thoroughly investigates any and all allegations of abuse.” She reiterated Bridges’ denial of the allegations in the lawsuit and said the school “looks forward to the opportunity to fully exonerate itself.” The lawsuit is ongoing. If neither agency is enforcing regulations about the use of restraint and seclusion, it’s no surprise that they are not keeping good raw data either. The D.C. charter board said it doesn’t keep data on restraint and seclusion. The only documents it keeps that describe such cases are complaints from parents and families when they feel their children have been improperly restrained or secluded. The board found 43 complaints from 2011 to 2016, but it declined to release them to POLITICO to protect students’ confidentiality. Jamia Morrow helps her son, King Norris, with his homework. Without meaningful regulation at the local level, the protection of children in D.C.’s charter schools, among the biggest charter networks in the country, is left entirely up to the federal government and the Education Department’s Office for Civil Rights. And with the department’s increasingly hands-off approach and longtime unwillingness to enforce its reporting requirements, the schools are almost entirely unregulated. The Office for Civil Rights sent letters to the 135 districts that didn’t submit data, but aside from those letters and a few other steps in egregious cases—for example, when every school in Florida submitted zeros to the 2013-14 survey—the department hasn’t pursued the vast majority of non-reporting districts. The only other option for the department to punish non-reporters would be to cut off federal dollars.But it never does that. “The quality of the CRDC depends on accurate collection and reporting by the participating districts,” said Hill. She added that each district superintendent or someone they designate is required to certify the accuracy of the district’s data. Enforcement of the rules requiring schools to report their data falls to a few hundred employees in the Office for Civil Rights, who are also responsible for enforcing schools’ compliance with all other federal anti-discrimination laws. The latest budget proposal for the Education Department included funding for the Civil Rights Data Collection, to the relief of many advocates who feared it might be removed altogether, but the budget also cut 46 full-time-equivalent positions from the Office for Civil Rights. This lack of oversight in Washington’s charters was an unwelcome shock to Jamia Morrow, who says her son King Norris had been doing well in school until he arrived as a first grader at Achievement Preparatory Academy in the Washington Highlands neighborhood in the fall of 2014. The school ranks highly for standardized test scores, and Morrow wanted her son, who has been diagnosed with behavioral issues, to be somewhere that would keep him academically challenged. Soon after the school year started, according to allegations in an administrative complaint brought against Achievement Prep with the Office of the State Superintendent of Education in 2015, King began having trouble with another student, who King said was picking on him. King was suspended for physical aggression, and his teachers took him away from class frequently to spend time in the school’s “crisis room,” said Lewis Bossing, an attorney who works for the Bazelon Center for Mental Health Law, which filed the complaint. Bossing says that several parents told his colleague that the school’s crisis room was essentially a repurposed closet—a piece of paper covered the only window on the door. “Consider holding a young child in the closet at a school,” he says. Lewis Bossing, senior attorney at the Bazelon Center for Mental Health Law, brought a case forward against a charter school in D.C. alleging repeated use of restraints and seclusion. Administrators from Achievement Prep said they stopped using the crisis room after the complaint was filed, according to an interview with Bossing. The school signed a settlement agreement a month later that required teacher training on how to handle special education students, including a session on “positive behavioral interventions.” Under the settlement, the school admitted no liability or wrongdoing; no financial payment was requested. 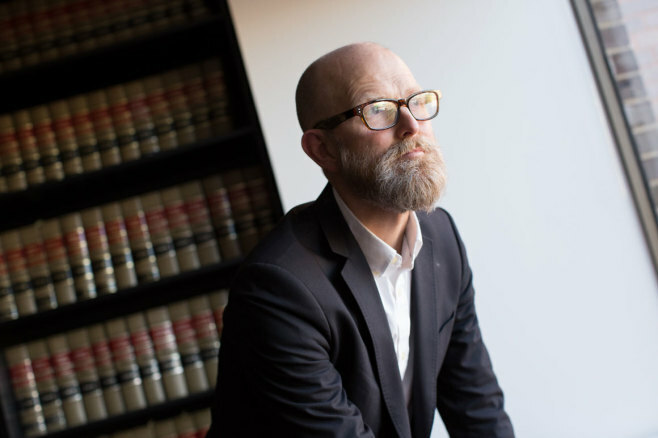 Ben Hattem is an award-winning journalist who covers mental health care in New York’s justice system and elsewhere.